The voice works through the interaction of breath flow, vibration, and the open spaces of the resonators- nasal cavity, pharynx, facial sinuses, oral cavity, upper chest.The Alexander Technique increases breath capacity by freeing up the ribcage to expand laterally. It helps to lower the vocal pitch, by releasing the muscles attached to the laryngeal cartilage. 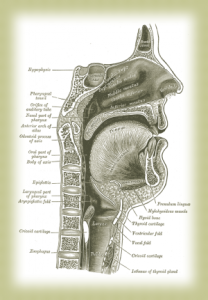 By increasing the space in the resonating chambers of the body (for example by lifting the soft palate, therefore increasing the size of the oral/pharyngeal chamber), The Alexander Technique invites more resonance through the body. Other resonating chambers are invited to expand, for example the upper chest, nasal and facial sinuses, all with the potential to increase vocal resonance. The vocal folds of the larynx move together to make sound. If the muscles attached to the laryngeal cartilage are too tense, a high pitched sound is produced. The expression ‘projection of the voice’ is not helpful, as it suggests we need to force the voice from our body. This leads to tightening and restricting of the very voice we wish to project. By bringing sound back into our bodies and realising our full internal space, the voice can expand to be powerful and free-flowing, and can develop a rich quality of resonance. Whether singing or speaking, these AT principles can be applied to improve voice quality. When working with the voice, the Alexander Technique teacher involves the whole body. 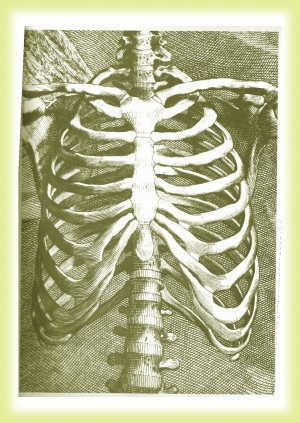 To have depth and resonance, the voice needs to come from and resonate in the whole body. The process is hard to compare to any other. It involves enhanced body awareness and a recognition of habits. There follows a gradual freeing up of the tensions within the body caused by those habits. increased capacity for spontaneity and joy. The ability express emotion with energy, openness and clarity is essential to the successful vocal artist. The Alexander Technique allows us to distinguish between essential energy needed for voice, and tension that limits our vocal potential. Emotion is carried on the vowel sounds. To make a vowel sound you need a constant unbroken stream of air. When applying the AT to voice work, we emphasise articulating the vowels as freely and effortlessly as possible. We teach a procedure called ‘the whispered “ah”‘ to help free up the vowel sounds. This has the added bonus of lifting the soft palate, increasing the capacity of the oral cavity, and enabling a more full, resonant sound. “If we keep doing what we have always done, we will keep getting what we have always got”. To really get the hang of a whispered ‘ah’, please see an Alexander Technique teacher for lessons. Here are the steps you will take with your teacher, and then practice for yourself. repeat 4-5 times if desired.